Craig Mackail-Smith's late header at Chesterfield that was ruled out for offside. Photo: Joe Dent/theposh.com. Mackail-Smith looked to have settled an entertaining contest 10 minutes from time when he stooped to head the ball home from close range, but all Posh celebrations were strangled by an assistant referee who flagged for offside. Posh manager Grant McCan during a frustrating game at Chesterfield. Photo: Joe Dent/theposh.com. Instead Posh had to make do with a point from a 3-3 draw at the home of a side who appear doomed to relegation. It was a frustrating night for a dominant Posh side who twice led - they were 3-2 up after half an hour - and who also struck the woodwork four times. The draw leaves Posh in 11th place, seven points off the play-off places and 13 points clear of the relegation zone. Mackail-Smith (2) and strike partner Tom Nichols scored the goals. “I am very disappointed,” McCann stated. “Mainly for Craig Mackail-Smith who should have been celebrating a hat-trick and a winning goal. Instead he’s sitting in the dressing room with his head in his hands. Posh striker Tom Nichols on the attack at Chesterfield. Photo: Joe Dent/theposh.com. “I’ve watched the dvd back and it’s a ridiculous decision to give him offside. It wasn’t even close. I have no idea what the official was thinking. “I don’t know who we’ve upset, but very little is going for us at the moment. We’ve hit the woodwork four or five times here and created enough chances to have won three or four matches. “We could have scored seven or eight. Scoring three away from home is great. We were more ruthless than we have been, but not as ruthless as we need to be. “We always create chances and I was pleased that the front two both scored as they’ve had some criticism lately. Junior Morias should also have scored at the end when he hit the post. “Craig Mackail-Smith was outstanding. He loves playing for this club. His workrate, his energy, his pressing, his finishing and his all-round appetite for the game were all impressive. “We actually played really well. We played well for 25 minutes on Saturday against Oxford, but we played like that for the whole game here, apart from a 20-minute spell in the second-half when Chesterfield had their inevitable spell and equalised. “All three goals were disappointing especially the third one, but there were many good signs. Not losing is a forward step after three straight defeats and we were very positive from the first whistle. “We should have been more than a goal up at half-time as we had been so dominant, but it’s a step in the right direction and one we can build on. 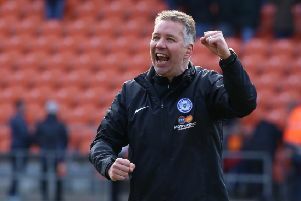 Posh host Oldham in a League One fixture at the ABAX Stadium on Saturday (March 18) when Marcus Maddison could return to the squad after missing the last two matches with an ankle injury.